What would you have to do to get a citation? Park there for more than 10 hours. But how can they tell how long you have been there without a meter? Places around here mark your tires with chaulk and then come back after the time period and ticket you. 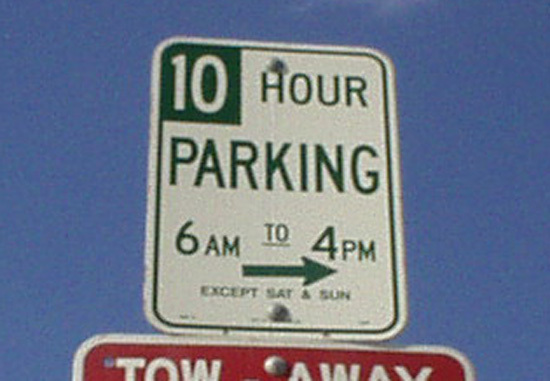 But that 10 hrs applies only between the hrs of 6 & 4, and only on weekdays. The rest of the time you can park as long as you like. if you got there at 5am wouldnt you then get a ticket at 3:01pm since you exceeded 10 hours during the time that you are not to exceed 10 hours? But wouldn't the "clock" on your 10 hours only start running from 6 a.m.? Just goes to show you that even when you think it is spelled out fairly simply, there is a wide range of interpretation. I think that the FPN: TOW AWAY implies that any time other than the listed permissible times would result in a tow. But then would that mean that no parking at all Sat. & Sun.?? This needs to go before the panel again at next session. Actually, the arrow for the tow-away zone points the other direction. This is the dividing line. Also, there's a guy that lives under this sign. We had to evict him from the warmth next to a utility transformer to do our project, so somebody got him a tent. Downtown LA is quite a "different" type of place.